Blocked gutters are a common problem. Leaves and other material get blown onto roofs and drain into gutters and downpipes every autumn. This can easily cause blockages if enough debris collects. That’s when problems start! It’s a good idea to prevent against blockages by having your gutter cleaning done on a regular basis. Fixing or replacing guttering and downpipes that have broken as a result of becoming blocked could cost you more than regular cleaning. 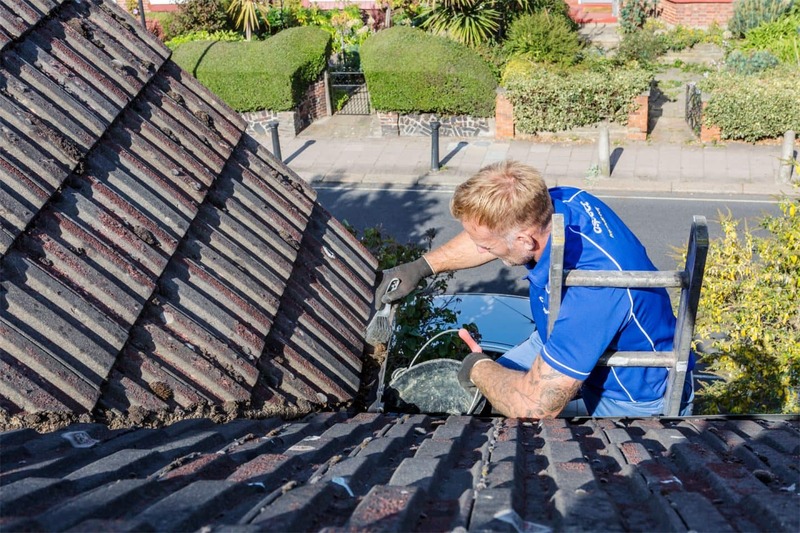 An Aspect roofer can safely access your gutters, cleaning them of debris and checking for any potential problems. If enough leaf litter, moss, and other debris build up in your gutters and downpipes to cause a blockage you should arrange to have them cleaned as quickly as possible. If you don’t, you can expect bigger problems. The weight of water and soaked debris that builds up behind a blockage puts excess pressure on gutter and downpipe joints. This extra weight can cause sections of guttering to sag, joints to open and support fixings to weaken. In addition, the rainwater that no longer drains away will flow over the top of the guttering and cascade down the brickwork. A visible sign of this process taking place is the growth of moss and algae on brickwork. This can cause damp and, if the gutters aren’t cleared. In severe cases this could even reduce the structural integrity of your property. Gutter guards are a relatively cheap and simple solution to the problem of gutters becoming blocked on a regular basis. They’re designed to stop debris from collecting, but still allow rainwater to run away. Most gutter guard products will last for years. However, you’ll probably need to remove them occasionally and clean excess debris from them. This will allow them to continue working well. We always recommend asking a professional roofer to safely access any part of your roof or guttering. It’s not worth the risk of climbing a ladder, working at height and suffering personal injury if there’s an accident. An Aspect roofer can install new guards or clean existing ones quickly and safely.